Peelander-Z will host “P-Party #4″ at Death by Audio tonight (8/7) featuring The Netherlands (billed as “A KIND OF FUTURISTIC BIKER ROCK”), Drums & Red & Tuba (“Electronic Tuba Rock” featuring Peelander Red), Japan’s Ryo Inoue and PeeWonder-Z (“Sister of Peelander-Z”). Though Peelander-Z wont actually be performing, I wouldn’t be surprised see each of them jump on stage during the show, much like they did with Anamanaguchi recently. 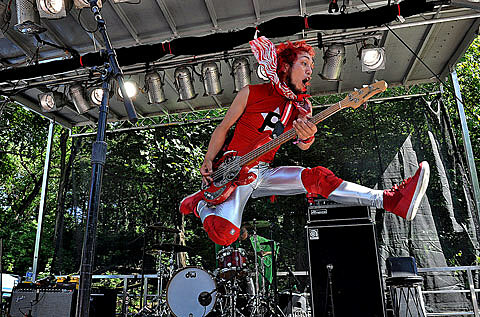 Speaking of the mighty Peelander-Z, the band will hit the road with Japan’s Electric Eel Shock for some US shows. So far the dates include only an LA and an NYC show, The Studio at Webster Hall on October 12th. Tickets go on sale on August 17th at 10PM. All tour dates and video from the 3rd P-Party show are below.